30A East Vacation Rental in Blue Mountain Beach with Gulf Views! 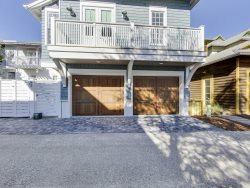 One of a kind townhome in the popular Blue Mountain Beach. This floor plan is unique to Sea Cliffs and is even unique to the 30A area. Use it as one full unit, with 3 bedrooms and 3.5 baths OR you can use it as two separate living quarters.Ample windows throughout the condo. Enjoy the condos complexes shared green space. VIEWS from the master bedroom and balcony. Recent upgrades include hurricane impact windows and XL impact sliders, completely renovated kitchen and master bathroom including gorgeous granite in the kitchen and Carrara marble in the bathroom and more! The pride of ownership will not go unnoticed! Not to mention all of the awesome things that Blue Mountain has to offer...restaurants, a bakery and health food store, bike rentals, just to name a few and all within walking distance. This truly is a GREAT FIND!